A lifesaver for those with young children and pets, our uPVC Stable Doors are practical and versatile. Working great in summer, this range allows the top half of your door to be open whilst the bottom half is locked. This means a refreshing breeze can enter your home whilst you can keep children and four-legged friends safely inside, not to mention you get a great view of your garden! 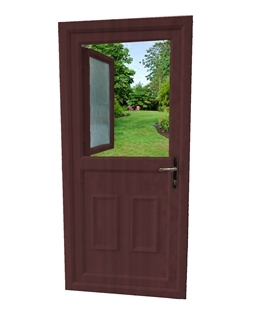 Our range of uPVC Stable Doors is available in 3 colours; White, Oak and Rosewood which can all be installed with either clear glass or you have the option of a variety of frosted patterns for privacy. When choosing your Stable Door, just select the ‘Glass options’ tab to make your selection. 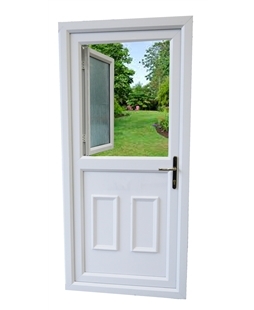 If this uPVC Stable Door range isn’t for you, we are also a trusted installer for Rockdoor and therefore supply and fit their Composite Stable Door range. Why not take a look at our uPVC Windows? Often when customers opt for a new door they also invest in new uPVC Windows to complete the look of their home and design it to their liking.